They will readily inhabit lofts, attics and roof spaces as well as outbuildings. Signs of their presence will be scratching noises and droppings; however, these can be mistaken for rat droppings. They are not thought to carry human diseases but can bite if they are frightened. In addition, grey squirrels may pass fleas to domestic animals which can be treated using animal flea treatments. 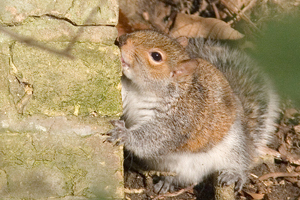 Adult grey squirrels are between 35-50cm in length and are between 450-650g in weight. They are grey-brown in colour. Squirrel kittens appear when they are around seven weeks old, and look like smaller versions of their parents. If grey squirrels are infesting your roof space, they can be denied access by sealing up access routes using chicken wire. However, you must ensure that there are no young or adult squirrels in your loft space before carrying out proofing work. Entrances to loft spaces can often be inaccessible, so you may need to contact a pest control company to carry out the work for you. They will also be able to advise when to carry out pest control so as to avoid the breeding season. If you suspect you have a Grey Squirrel infestation in Edinburgh, Glasgow, Aberdeen, Dundee or Perth, call GRAHAM pest control today and we could help.